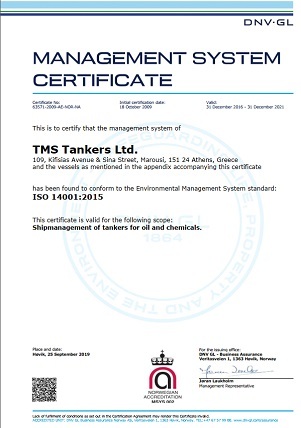 TMS Tankers commitment to energy efficiency and environmental awareness is best emphasised by company’s top management decision that the company and the vessels which it operates to be in compliance and accordance with a certified and approved Safety, Quality and Environmental (S, Q & E) Management System under the ISO 14001:2004 and ISO 50001:2011 Standards . 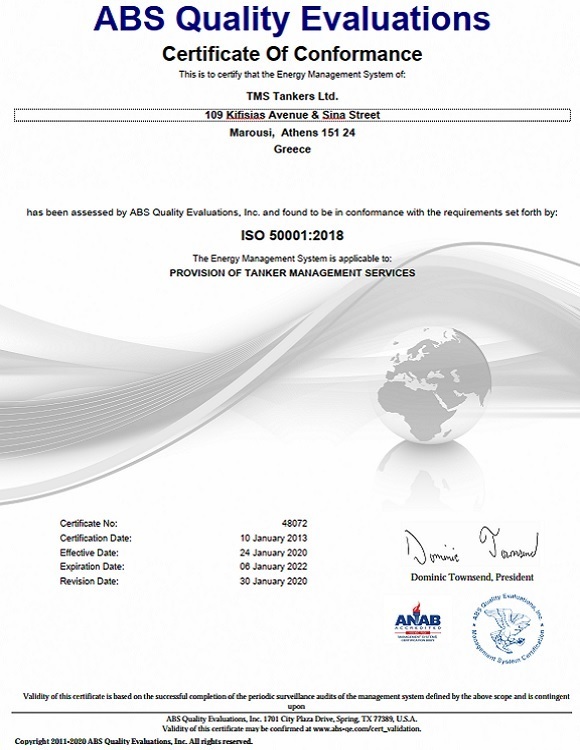 TMS Tankers was the first shipping company around the world that has certified our systems and processes against the ISO 50001 standard with the American Bureau of Shipping (ABS) under ANAB accreditation and demonstrated best practices for energy use and conservation on board our vessels and shore offices. We believe that performing our best in Energy efficiency will eventually result in best environmental protection by reducing air emissions as well as in improved operational performance by reducing energy cost. Careful planning, properly managed ship operations and personal commitment of everyone in the company is the way to achieve this. Energy efficiency and conservation is a way of life than just a mere compliance with rules and regulations. In this aspect, TMS Tankers has implemented an Energy Management System in accordance with the requirements of ISO 50001, with the objective of continually improving energy efficiency and reducing energy waste, setting and maintaining time-specific and measurable targets such as the Energy Efficiency Baseline, which should relate to a combination of design optimization, in-service performance monitoring and best-practice operational management processes. Our Company’s Energy Efficiency Management Policy is under a constant review, aiming to be always up-to-date with the evolutionary environment in which it operates and to function as the leader for the continual improvement of energy efficiency.